Air Pressure Experiments, Does Air Have Weight? To begin these air pressure experiments wave your hand back and forth in the air. It's easy to move your hand around because air pressure is pressing onto your hands in all directions. Air actually weighs 14.7 pounds per square inch at sea level. That means that every square inch of your body is being pressed on by 14.7 pounds of pressure. Cut three strings approximately 12 inches long. 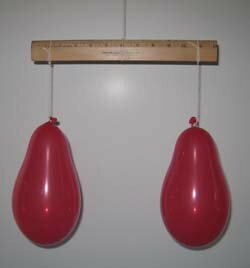 Blow up two balloons so they are the same size. Tie a string to each balloon. Tie one of the balloons to each end of the ruler tight enough so the string will not slip. Tie a string loosely around the center part of the ruler so that you can slip the knot back and forth until the balloons are balanced. Tape the string in place so it will not move when the balloon is deflated. Prick one of the balloons with a needle or sharp pin. Watch how the ruler moves upward on the side where the balloon was deflated. If this does not happen it might be because the center string was not tight enough and moved when the balloon was deflated. Try the experiment several more times to see if the experiment works consistently. This is the way real scientists do their work. They test their hypothesis several times to make sure the same thing happens consistently. Try these air pressure experiments. Balance two deflated balloons on a ruler or stick. Take one balloon off the stick and inflate it. Return the balloon to see what happens. Try balancing several balloons on a yard stick. When you have the yardstick in balance. Predict what you think will happen if you deflate all the balloons, one at a time, from left to right. After writing down your prediction, try this air pressure experiment. Air is a real substance and it has weight. That is why it weighs 14.7 pounds per square inch at sea level. What scientists mean when they give this figure is that if a column of air one square inch in size from sea level to the top of the atmosphere above Earth would weigh 14.7 pounds. If you travel up over a mountain pass air pressure decreases as you move upward. At 18,000 feet above the Earth the air pressure is approximately 7.35 pounds per square inch or half the atmosphere at sea level. Easy Science Experiment, Tin Foil Boats How many pennies do you think are the maximum you could put in a tin foil boat? Try this fun experiment and find out.